Ukraine – every day's a holiday! 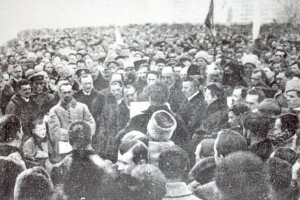 It was on January 22 in 1919 that the two republics making up what is now Ukraine signed the Zluky Act that would merge the two into one, thus uniting the Ukrainian people. The two republics were the Ukrainian People’s Republic and the West Ukrainian People’s Republic, and the triumphant ceremony took place at St. Sophia Square in Kiev (below). It is a rare holiday in Ukraine in that it does not mark an occasion of sadness, defeat, or bloodshed. Unfortunately this newfound unity of independence was short lived. That same year Bolsheviks gained control of the country and declared Ukraine a part of the Federation of Soviet Republics. Thousands of Ukrainians died in the fighting, but this is nothing to the numbers who would perish over a decade later when the Soviet dictator Joseph Stalin enforced an unprecedented, massive famine throughout Ukraine killing millions. On January 22,1990 the Ukrainians celebrated their Reunion Day publicly and proudly for the first time, creating a 300,000 person human chain that stretched from Kiev to Lviv. This show of solidarity hastened the downfall of Soviet influence over Ukraine, which declared its independence in 1991. Reunion Day is a rare holiday in Ukraine in that it marks neither tragedy nor defeat nor bloodshed. On this day in 1919, West Ukraine joined Greater Ukraine. The two republics signed the Act Zluky to form an independent united Ukraine. The triumphant ceremony took place at St. Sophia Square in Kiev. Later that year Bolsheviks gained control of the country and declared Ukraine a part of the Federation of Soviet Republics. Thousands of Ukrainians died in the fighting. But that was nothing compared to the number of those who would perish during the horrifying Holomodor. The Holomodor, literally “plague of famine,” was one of the most gruesome chapters in European history. 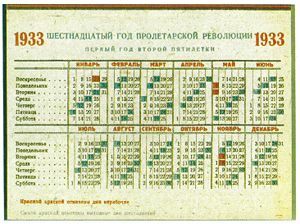 Soviet dictator Joseph Stalin implemented the Soviet Union’s first Five-Year Plan in 1928 to boost national productivity. Nationalization appeared to work in the industrial sector as millions of workers flocked to urban areas to work. Agricultural was another matter. Stalin failed to foresee (or simply didn’t care about) the demoralizing effect of collectivization on small peasant-owned farms, and he underestimated farmers’ attachment to the land. Collectivization resulted in lower yields and in some cases rebellion. Due to low yields, the Soviet government punished the farm workers by seizing the crops they reaped in order to feed the cities and other parts of the Union. Nowhere was this practice more brutal and devastating than in Ukraine. Blaming Ukraine for the failure of the plan, Stalin attempted to force the republic into submission by instituting the world’s most vicious man-made famine. It’s hard to imagine a death more cruel than slow murder by starvation. And to watch powerlessly as one’s village, family, and children wither up over the course of several months or a year. Between 1931 and 1932 the Holomodor killed an estimated 7 million Ukrainians. The famines of the Ukraine led to mass emigration to other parts of the globe, notably Canada and the United States. After World War II, the Soviet Union consistently denied the extent of the Ukrainian Genocide. On January 22,1990, still under Soviet power, Ukraine celebrated the anniversary of its short-lived 1919 independence publicly and proudly for the first time. 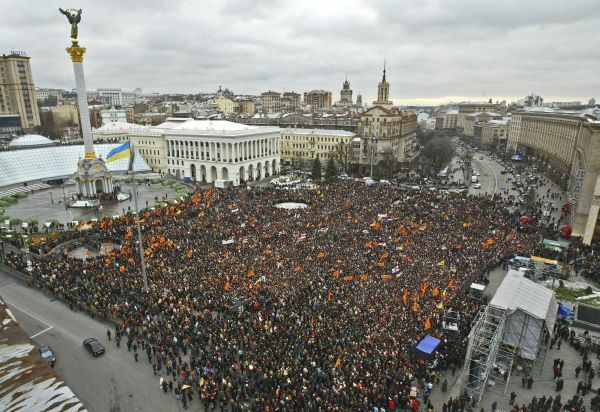 On that day a human chain of 300,000 people stretched from Kiev to Lviv. The show of solidarity reinvigorated Ukrainian nationalism. Ukraine declared its independence in 1991. To this day Russia has not recognized the Ukrainian Genocide. So when Russia and the Ukraine battle over gas lines, it’s about more than gas. “There were blockades along all the highways, where militia, NKVD men, troops were stationed; the starving people were not to be allowed into the cities. Guards surrounded all the railroad stations. There were guards at even the tiniest of whistle stops. No bread for you, breadwinners! Before they had completely lost their strength, the peasants went on foot across country to the railroad. Not to the stations where the guards kept them away, but to the tracks. And when the Kyiv-Odesa express came past, they would just kneel there and cry: “Bread, bread!” They would lift up their horrible starving children for people to see. And sometimes people would throw them pieces of bread and other scraps. The train would thunder on past, and the dust would settle down, and the whole village would be there crawling along the tracks, looking for crusts. But an order was issued that whenever trains were travelling through the famine provinces the guards were to shut the windows and pull down the curtains. 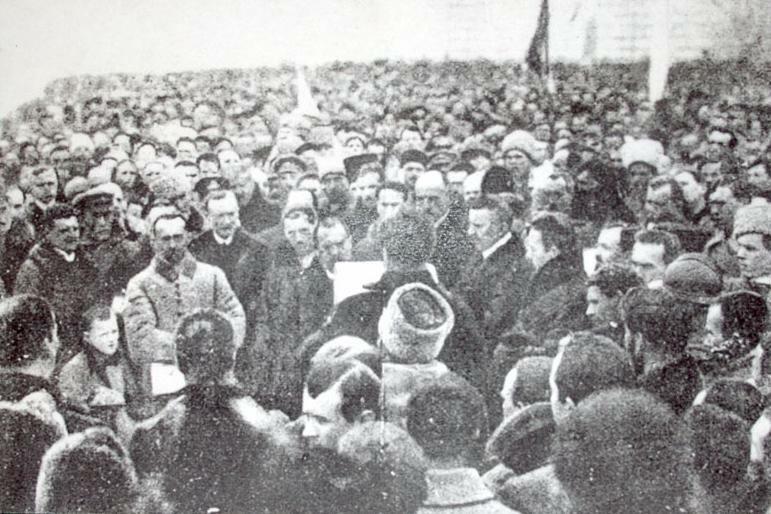 Back in 1959 Lukyanenko had helped to form the underground organization “Ukrainian Workers and Peasants Society”, for which he wrote the party program. For his involvement, he was sentenced to execution, a sentence that was later mitigated to fifteen years hard labor in the Gulag. His time didn’t dim his revolutionary fervor, but cemented it. After his release, he helped found the Ukrainian Helsinki Human Rights Group. 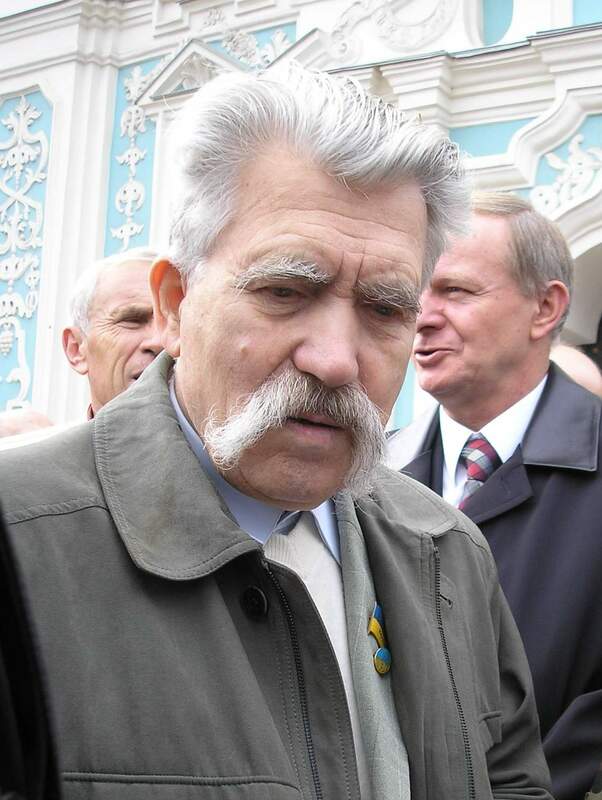 Lukyanenko was released during the Soviet prestroika reforms of the 1980s. In 1990 the former enemy of the state was elected to the Ukrainian parliament. Oh, and it’s Ukraine, not The Ukraine. It means “Borderland”. Ukraine also gave us St. Nestor the Chronicler (c. 1056 – c. 1114), the monk who spent twenty years writing the great Russian and Ukrainian history “The Tale of Bygone Years”, or “The Chronicle”. In Russia and in several of the countries that were formally part of the Soviet bloc (including Belarus, Ukraine, and Moldova), today is Victory Day. 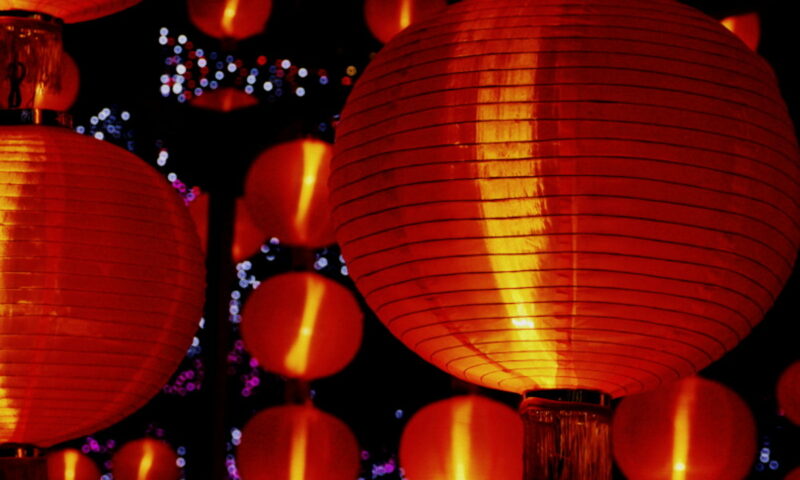 It celebrates the surrender of Germany in 1945 and the end of World War II in Europe. France, the United Kingdom, and other Western European countries celebrate Victory Day on May 8, but it was already the following day when the news hit Russia, the only country in the world that spans 11 time zones. And ever since then, May 9 has been celebrated with full Russian military pomp and circumstance. This year (2010) troops from England, France and the United States participated in Russia’s Victory Day parade for the first time. In addition to its effective armored “Tank Corps” attacks, for which Germany never developed a practical countermeasure, the Soviets made use of their biggest advantage: Europe’s largest population. They overpowered the Germans with sheer numbers and indomitable resilience. The unfortunate result of this strategy was that over 20,000,000 Soviets were killed in the war, nearly half of them civilians. 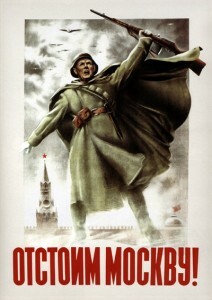 Standing out even among the battles of the Eastern Front were the Sieges of Leningrad and Stalingrad. 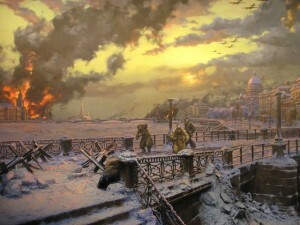 Leningrad lasted nearly 900 days and was the deadliest siege in world history. But it was the Battle of Stalingrad that marked the turning point of the war and eventually broke the back of the German army. The final battle of the war (in Europe) and indeed the last major battle on Western soil was the Battle of Berlin. 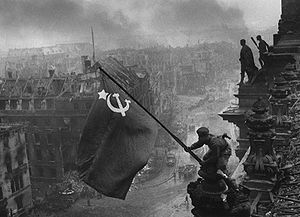 In April 1945, the Soviets plowed into Berlin with 2.5 million soldiers. Hitler committed suicide in Berlin on April 30. Germany officially surrendered on May 8, 1945.